65 Years of Service – Thank you, Brother Richard Welker. 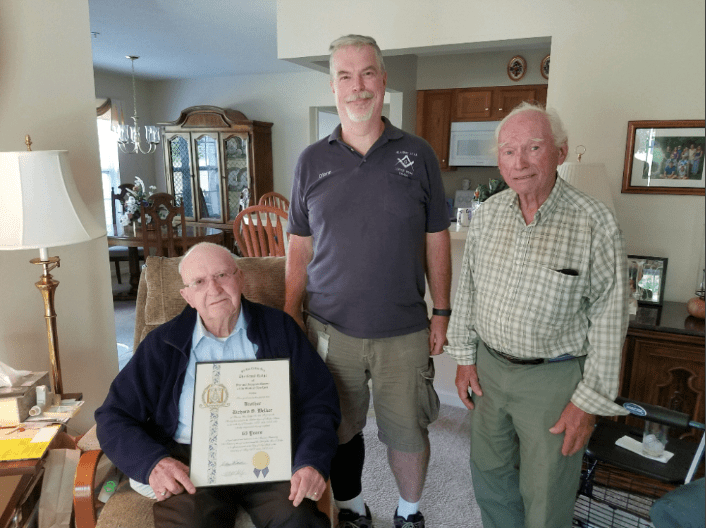 Our current Worshipful Master and Brother John Evans visited with Brother Richard Welker to present him with a certificate and pin to congratulate him on 65 years of service to Masonry. Brother Welker joined Masonry in 1953 at the age of 25. Our Brother was Raised at Transportation Lodge #0842 where he spent most of his time in the Quarry. In 1990 he associated with Blazing Star #694 where he continues his work. Brother Welker also celebrated his 91st birthday this July. Thank you for your years of service Brother and Happy Birthday!